I was looking for a project that I could use to go through the process of understand using Kickstarter, one of the crowdfunding websites. Kickstarter (Kickstarter.com) is the most well known for its assistance in supporting the creative arts, including 2-D, 3-D, Dance, Theater, Technology, Gaming, Design and several others. Potential supporters review the projects and pledge funds towards a successful campaign. In turn, they receive a reward, for example a book. The pledge provides funds to publish and distribute rewards to the supporters. The other advantage is the abilities for projects to open markets from local to across the globe. Kickstarter has provided access to thousands of creative ideas since 2009, while raising millions of dollars to help launch projects. 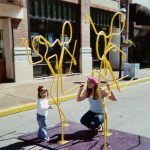 After reviewing my past work, The Shtick People Project, developed as a special experiential exhibit for Art on the Square in Belleville 2005, became the obvious creative endeavor that seemed to have correct appeal for crowdfunding. When I combined painting and small metal Shticks within the work along with my daughter’s poetry at the 2008 Art on the Square, they were very well received. The project provided a great foundation to create an art book displaying paintings, Shtick models, Life-size Shticks and expressive verse. Mid-2015, Ayanna and I started discussing and organizing a Draft copy. Initially, we made quick sketches of the pages, plugging in what might work, what would need to be developed and a general approach to the story content. Since most of the work that we produced in 2005-2008 were stand-alone pieces under the Shtick People Project, we needed to find a means to create continuity for the book to work. Our graphic artist solved that by formatting the pages as a family scrap book. The Shtick People Family could now evolve as individuals yet a tightly knit group. Over several months, between our regular work schedules, we refined existing ideas and developed new concepts for displaying the Shticks. I started laying out pages of the book on Adobe Photoshop, so that we could better understand what we had and what we needed. Ayanna generated new words and verses to fit the new Shtick antics. For example, I thought of a flying elephant based on my college dorm mascot from 40 some years ago. Ayanna created a delightful poem while I created a Shtick People with arm stretched high and holding a wire line. The final art will include a shadowy shape of a flying elephant above without exposing the nature of this beast. This process repeated itself dozens of times with the variety of Shticks. Even though the book has 70 + pages and displays 40 + character situations, we have many more ideas listed. The flow of circumstances picked up speed as we understood that Life is our palette and there is an endless stream of experiences to capture.